There are many fun and interesting activities you can do at your Tree Planting Party. Check out a few of these ideas – they can also be fun ways to keep your community engaged with your trees after they’re planted. Float apples in a tub of water. Retrieve an apple without using your hands, only using your mouth. Each person is allowed three attempts before giving up. Two or more teams are arranged in a line with their hands behind their backs. An apple is passed along the line from chin to chin. If it is dropped it has to be passed back to the front of the line. The team that gets their apple to the end of the line first wins! Two or more teams are arranged in a line one behind the other. An apple is passed over the head of one player and through the legs of the next. The last person in the line has to run to the front of the line with the apple. If it is dropped the apple has to start again at the front of the line. The first team that return to the original line up wins! The aim of the game is to see who can make the longest continuous apple peel in the shortest amount of time. Write a poem about your new apple tree. What does it symbolize to you? Use all your senses. Help your apple tree envision its future: Draw a picture of what your apple tree looks like now, then draw another picture of what it may look like in 3 or 4 years. What about 10 years? 30? 100? Picture the Past: Draw a picture of what an apple tree on your site might have looked like 100 years ago. Think about how the city, streets, and buildings might have looked different or the same? A Year in the Life: Draw a series of pictures depicting an apple tree as it changes through the seasons. What does it look like in early spring, covered in blossoms? In summer, lush with leaves? In the fall, laden with fruit? And dormant in the winter? How does it look between these seasons, during the transitions? Pretend you’re standing next to your trees in 50 years. Describe what they look like. Describe who you are. Describe your community. How will you and your community blossom in the years to come? Read and discuss Thoreau’s essay, “Wild Apples.” What do wild apples symbolize to him? Apples play a large role in mythology. Greek Mythology describes how Hercules was challenged to obtain one of Hera’s magical, healing apples, which were guarded by a fierce dragon. Find out how the battle ended and explore how apples have appeared in other mythological traditions. Read “After Apple Picking” by Robert Frost. How does he represent apples? How have other poets written about apples? Explore various representations of apples in poetry. As with many of nature’s offerings, apples take on different symbolism in different cultures. In China, apples symbolize peace and apple blossoms are a symbol for women’s beauty. Find out what apples mean to people around the world. Browse the articles and books in our section on resources for further investigation on our website and in the appendix below. You can share them with your Delegation and discuss. From Asia to the Mayflower, discuss the apple’s history with your Delegation. Where do apples come from? How were they brought to the United States? How many varieties are there? Resources: Check out a Great Moments in Apple History timeline online, read books about Johnny Appleseed with younger kids and older students, and read about Apples by Roger Yepsen. What is their special connection to New England, and Massachusetts specifically? Research the apple varieties that grow locally. How long have they grown here? How many varieties are growing here? Identify the farms where each of your favorite apples grow. Resources: For information about local varieties and locations of orchards, check out the New England Apple Growers Association. Discuss scriptural references to fruit and fruit trees. How are fruit trees described and portrayed? What is the spiritual significance of planting trees and taking part in the natural cycle of the seasons? Discuss how faith communities can be stewards of the earth. Resources: Look to your own faith about what it teaches about planting, growing, and the natural world. But also take the opportunity to speak with people of other faiths about their beliefs – you may learn about some interesting differences and similarities. Learn about how different people and faiths have considered trees sacred throughout history. Learn about apple varieties throughout the U.S. and throughout the world. How many varieties are there in the world? How many grow in the U.S.? Discuss with your delegation. Resources: Check out Slow Food USA’s Ark of Taste information about apples, and be sure to read their RAFT Forgotten Fruits Manual and Manifesto on Apples. Read more about heirloom apples through Organic Gardening and Yankee Magazine. Does your family use apples in any family recipes? Does your grandma, mother, uncle, or brother have a favorite apple? Explore your family’s relationship with apples and agriculture. Resources: Check out our favorite apple pie recipe below. [hyperlink to section] For more inspiration and ideas, check out An Apple Harvest: Recipes and Orchard Loreby Frank Browning or the Apple Cookbook by Olwen Woodier. Also check out great cooking blogs for their apple ideas, including Smitten Kitchen, Food52, and Epicurious. For ideas on preserving apples, check out Punk Domestics, a site that rounds up great preserving ideas from all over the web. Sample apple slices from a number of different varieties. Try to find examples of the varieties you are planting. Recognize the differences in taste, texture, and smell. See if you can do a blind taste test and recognize your favorites. 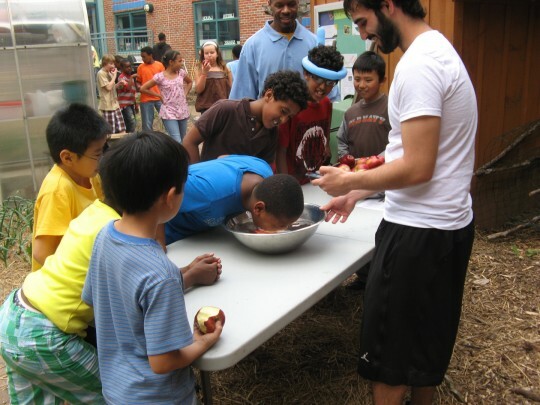 Resources: Here is one source’s idea for holding an apple tasting party. Get more information about apple varieties from PickYourOwn.org. How can outdoor activities such as tree planting and gardening improve your personal health? What impact can growing apples (and other fruits and vegetables) near your home have? How can planting trees and building gardens better the health of the community? Discuss how. Discuss some of the benefits of consuming organic foods. Think about this discussion on a personal, communal, and global level. What are the benefits of having fruit trees in the city? Discuss food access, urban wildlife, environmental health, urban gardening and homesteading, and the city as an ecosystem. How does the health of our environment affect our personal health and the health of our communities? How are we part of our urban ecosystem? Trees take in carbon dioxide and produce oxygen. One tree can produce the amount of oxygen that ten people will inhale in a year. How can tree planting be an effective tool to respond to the impact of global warming? What happens when you plant an apple seed? What’s a graft? How do apples grow? Explore the biology of apples with your Delegation. A recent analysis of the complete DNA sequence of the apple has lead scientists to believe that a major step in the evolution of the fruit was caused by a catastrophic environmental event, possibly the same one that killed the dinosaurs. Explore this finding further to reveal more about the apple tree’s evolution.